George Jenkins, Sampson Davis and Rameck Hunt were three African American kids living in the inner city of Newark, all from broken homes, all living amid poverty, crime, and drug abuse. Two served time in juvenile detention centers. They met in high school and together they made a pact: they would support each other for as long as it would take for them to become doctors. Through an affirmative action program, they enrolled at Seton Hall University's premed program, from which they graduated in 1995. In May 1999, they graduated with degrees in medicine and dentistry. The Pact is an extraordinary testament to the power of male friendship. Friendships among young men often revolved around taking risks, often unnecessary or even dangerous risks. This remarkable story teaches the power of friendship and proves the wisdom of Dr. Martin Luther King's proposition that amazing things happen when we "stand on the solid rock of brotherhood." The three supported each other through high school, college, and medical school. 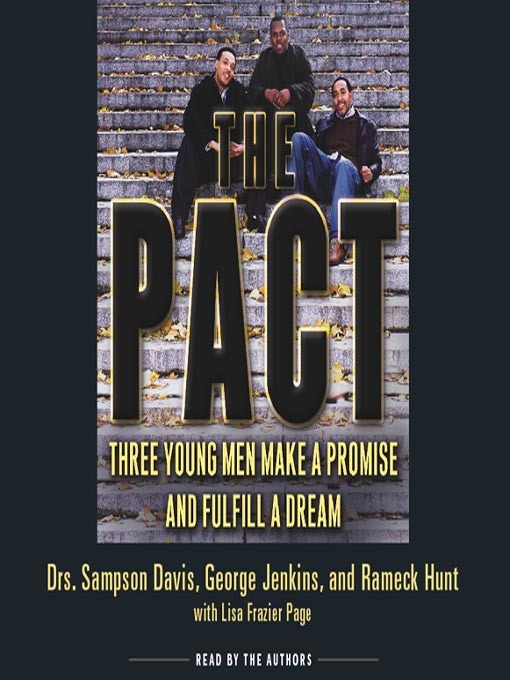 Their success, which was due to unwavering, mutual support, shows that young men can help each other avoid trouble and fulfill their dreams by using their strong friendship as a powerful antidote to the temptations and pitfalls of inner-city life.